Ooooh… thanks for the info, Lara, and welcome aboard! Had a few people tell us they’ve been having issues with commenting on the website lately… spam filter too aggressive. If this has been happening to you, drop us a line and let us know! We’ll manually override Mr. Spamilator. MOAR SHADOWBINDERS? 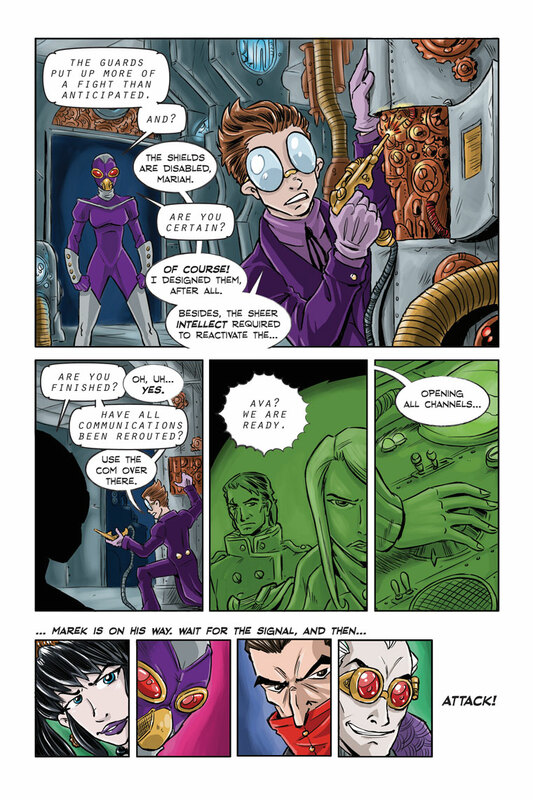 Still kicking around the idea for an IndieGoGo campaign to raise funds to hire a colorist to help us get more pages out. We’re looking at about $10K for a year’s worth of pages, however (150-175). I love the dynamic you have going between the tinted and not tinted pannels. Thanks! I was trying to get across that Ava was elsewhere. Poor Gaylord, all that hard work and no one even listens to him. Gaylord is sort of like our Meg Griffin. Somehow I think that Gaylord isn’t long for this world… unless he has skills that make him worth keeping around. There may or may not be a high body count in future chapters. Gaylord may or may not be among the casualties. Gaylord just made himself expendable. Worse, actually, a target. He’s too proud of himself to realize that Mariah’s only reason for being there is to exterminate him before he has a chance to change his mind, and re-enable the shield. If I were him, I would have said, “it’s down now, but I have to keep it from rebooting itself until the attack is over.” Then I would have fiddled around with the mechanism until the battle was over. More of a fight than expected? They barely lifted their guns… how did she think they would react to someone murdering them?